Dominique thank you for your comment. Krishnan thank you for your comment. Nancy thank you for your comment. Joan thank you for your comment. Congratulation on your sale, Carole! Chris, thank you for your comment. Yucel, thank you for your comment. Harriet, thank you for your comment. 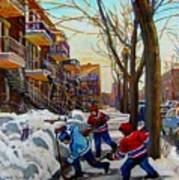 So full of life just a fabulous painting! Lenore, thank you for your comment. This is really appealing to me!! v/f! Dominique, thank you for your comment. Very nice image! 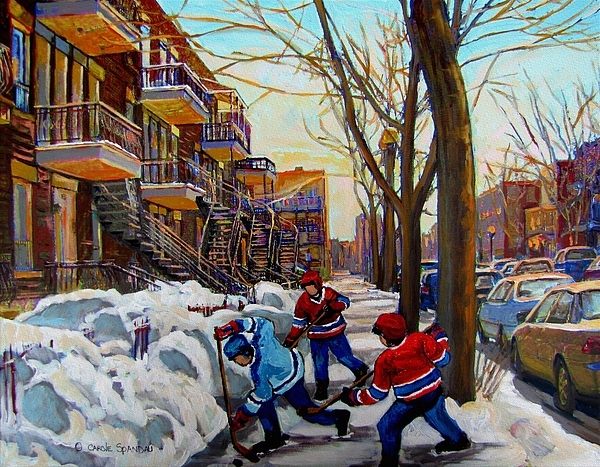 Nice hockey game in the streets of Montreal! Wonderful!! Congrats on your sale! Terry, thank you for your comment. Georgia and Myrna thank you for your comments. 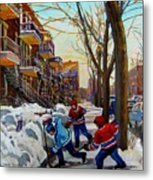 WHEN I TAUGHT ART AT DARCY MCGEE HIGH SCHOOL, DURING THE SEVENTIES TO THE EIGHTIES, AFTER HAVING BEEN A STUDENT MYSELF AT BARON BYNG HIGH SCHOOL, ONLY BLOCKS AWAY. I FELL IN LOVE AGAIN WITH ALL THOSE WONDERFUL OUTSIDE STAIRCASES.. 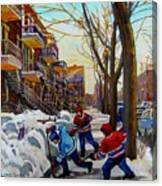 THESE ARE SOO MONTREAL...AS IS THIS GAME OF STREETHOCKEY...A PERFECT MEMORY TO PURCHASE FOR YOURSELF OR FOR A GIFT..